A court in Libya has sentenced Seif al-Islam Gadhafi, son of slain Libyan dictator Moammar Gadhafi, to death by firing squad for murder and inciting genocide during the 2011 civil war. 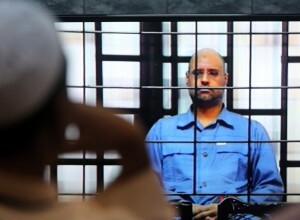 It is unclear when Tuesday’s sentence will be carried out since a militia in western Libya refuses to turn him over to the government, the Associated Press reported. The court in Tripoli also sentenced to death eight other ex-officials, including former spy chief Abdullah al-Senoussi, foreign intelligence chief Abuzed Omar-Dorda and former Prime Minister Baghdadi al-Mahmoudi. The rulings can be appealed.